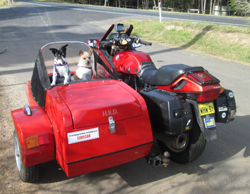 Late call to see if anyone is interested in going to the Loaded Dog Rally at Tarago in NSW this weekend. I have just found out that the family event I was committed to this weekend has been cancelled so I have an open calendar. Enjoy Gaz, I can't make this one. The kids and myself are taking Kay for a 6 night mothers day cruise to the south pacific island's. Wow Smithy, all I can say is how many brownie points must that be worth? Bit of a snap decision on my part. Took off at midday and just having late lunch in Rylstone. Hopefully plenty of brownie points, and an enjoyable week away. You'll find Marie and I round the far end of the fenced sporting area. Is away from the noisy bits. We go every year. Can be both cold and very windy. OK Al, see you there. I'm holed up for the night at the Taralga pub enjoying the fire - the last half hour riding was a bit cool. Any other adventurers from the forum heading to Tarago tomorrow? If I didn't already have a pretty full schedule, I might have crashed the party. Hope you got home OK through the the rain, Gaz. Yeah Bill, home safe and sound just on dusk. Pretty cold and damp up until almost into Bathurst - not heavy rain but enough to make the roads slippery. Probably UK/Ireland type rain. Spent a pleasant evening around the fire with Al & Marie and a few new acquaintances.